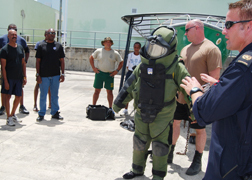 Able Seaman Omar Holligan of the Barbados Coast Guard, third from right, demonstrates a 60-pound bomb suit which divers use when handling underwater explosives. Chief Petty Officer Second Class Andrew Tiffin of the Royal Canadian Navy’s Fleet Diving Unit Atlantic , at right, explains to course participants how the suit is used. BRIDGETOWN, Barbados – Law enforcement and defence forces from the United States, Canada and 15 Caribbean countries are taking part in Exercise Tradewinds 2012. Tradewinds is a U.S. Southern Command-sponsored annual security training exercise. It is an inter-agency, multi-national exercise designed to enhance the collective abilities of Caribbean defence forces and constabularies to counter transnational organized crime and conduct humanitarian assistance and disaster relief operations. The exercise features U.S. personnel from the Marine Corps, Coast Guard, Army, Navy, Air Force, National Guard, Joint-interagency Task Force-South, Naval Criminal Investigative Service, and the Federal Bureau of Investigation. They work and train alongside the Caribbean Disaster Emergency Management Agency, the Regional Security System (RSS) and military and law enforcement personnel from the 14 independent full CARICOM states, the Dominican Republic and Canada. Tradewinds 2012 focuses on strengthening existing regional partnerships and encouraging the establishment of new relationships through the exchange of mission-focused knowledge and expertise so each participating country will improve capabilities in what it considers key security mission areas. This year’s exercise marks the first time a Tradewinds host nation’s National Emergency Operation Centre and Joint Operation Centre have joined together with the CARICOM, CDEMA, the RSS and U.S. military and law enforcement agencies to conduct the exercise. “This year we have elevated Tradewinds to an exercise that focuses on operational level training for the command and control of forces and civilian agencies in response to security challenges and disaster relief crises,” said Col. Augustin Bolanio, U.S. Marine Corps Forces, South exercise director. Colonel Michael Ramos, Chief of Staff of U.S. Marine Corps Forces South stressed the value of Exercise Tradewinds to all of the nations involved. “The combatant commander and the U.S. government invest in this exercise because we recognize the value of working together to confront these common security challenges…. We are very confident that we are getting tremendous value in working together and sharing experiences with all of our partners and all of our friends and I see this exercise continuing in that light,” he said.